Recently on my personal Facebook page, I asked what adults would want to be given if we still went trick or treating. My friends responded with some creative ideas, like good chapstick and mini Brie cheese, and (not surprisingly) lots and lots of requests for “fun-size” alcohol bottles. I can see the pillow cases filling with scotch now. The reason I asked, though, is I’ve been thinking about Halloween and the treats we give out to kids. As someone with a sweet tooth, I actually love candy and do indulge in it from time to time, but as a nutritionist, it’s tough for me to feel good about handing it out to kids who probably aren’t eating that nutritiously in the first place. At the American Heart Association’s children’s museum where I work, we educate kids who don’t even know what a vegetable is. The only kind of corn they’re eating is the candy kind. (They also eat more Red Vines than anything that actually grew on a vine. And they know the Jolly Rancher, but have never met a real farmer… Okay, enough bad food jokes? I’ll stop now.) Kinda feels like I should put my money–and my Halloween treats–where my mouth is by giving kiddos who stop at my house something even just a little better for them than the average neighbor would. Plus, around our house, we’re still recovering from EASTER candy, not to mention all the birthday parties and school events that pass out candy like it’s going out of style. Do we really need to add MORE? 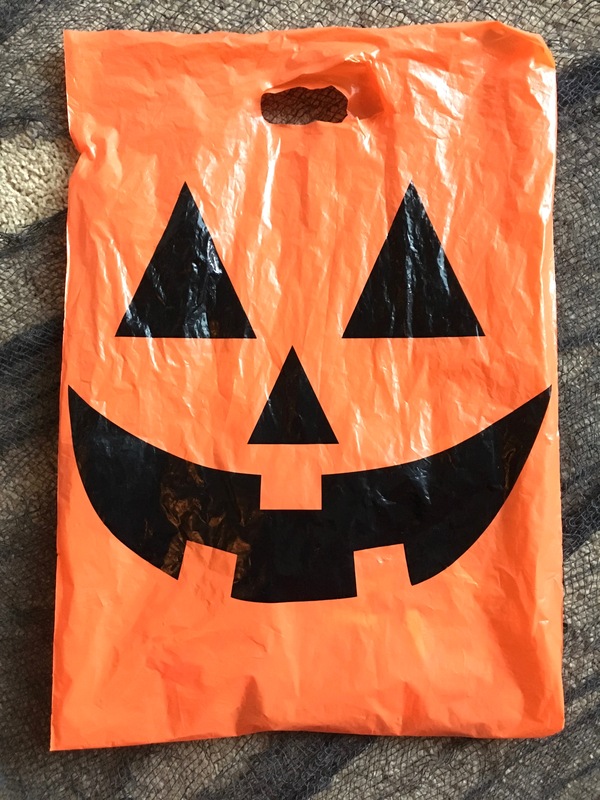 On the other hand, when I think about Halloween, I also don’t love the idea of giving out made-in-China plastic junk simply for the sake of giving something out that’s not candy. If you’re a parent like me, you see that stuff and wonder, How long until I can throw that out? It’s not great for teaching out kids’ about conspicuous consumption, and it’s really not great for the environment. So what does that leave us with? 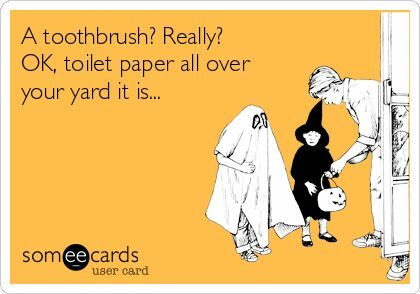 A bunch of lame options like seed packets or cough drops or the universally despised….TOOTH BRUSHES?? It doesn’t have to come to that! Here are 10 ideas for fun treats that aren’t candy or junk, but won’t mark you as the house to t. p. My daughter, without knowing what this list was, looked at it and said, “Oooh, I want that!” to almost every picture. The jury is still out on which one we’ll go with this year–how about you? From what I’ve seen, little candies give kids (and adults) the sense of “you can eat LOTS of these before it’s considered a serving.” Larger snack packages, on the other hand, send us more of a one-and-done message. 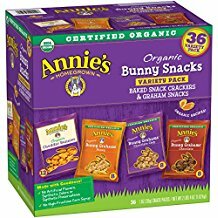 That’s one reason why treats like these Annie’s cracker packages may be a better choice for doing less damage in a single sitting. The other reason, of course, is that Annie’s crackers are relatively low in sugar and saturated fat! 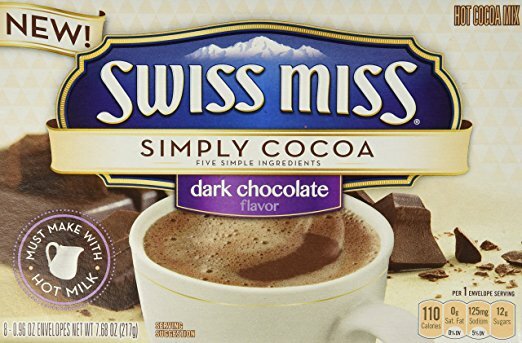 Yes, there’s sugar, but in addition to its real-food ingredients, this cocoa mix requires mixing with real milk. 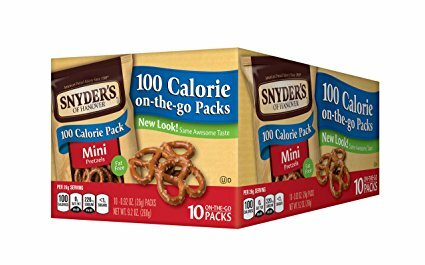 These Snyder’s pretzel snack packs come in at only $3.99 for 10–probably about what you’d pay per child with brand-name candy. Easy peasy for packed lunches, too! 4. 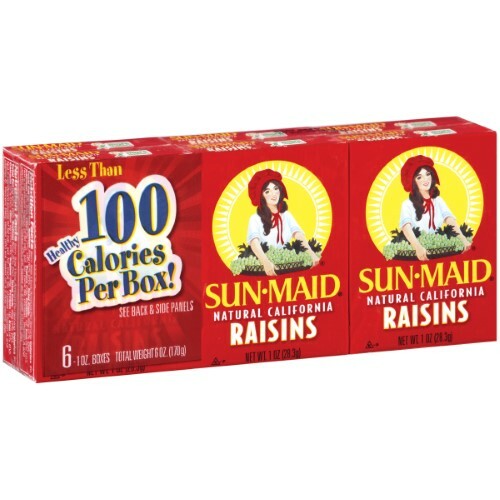 Raisin boxes These unassuming little snacks are great for on the go. They might not get kids as excited as something covered in chocolate or sugar dust, but once they’re in the pantry, they always get eaten. This one isn’t for every budget, but if you’re in one of those neighborhoods that pass out entire full-sized candy bars, take on the competition with protein-packed, lower sugar Kind bars. Several varieties have only 5 grams of sugar. These gummy snacks often start off with apple or other fruit puree as a base (check ingredient lists), so even though they’re quite sweet, they provide some fiber and nutrients. 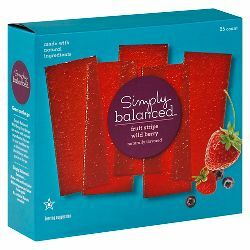 Target’s Simply Balanced fruit leather comes with 25 strips for $5.99. 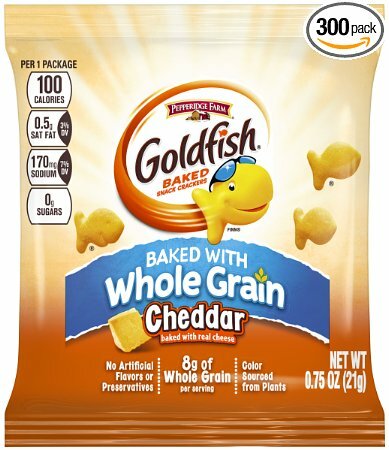 If you can find the whole grain variety of Goldfish in snack pack form, they’re really not bad, nutrition-wise! Lest anyone get up in arms about kids and food allergies, I would suggest that handing out straight-up nuts is a lot clearer and easier for kids and parents deciphering which treats contain nuts and which don’t. 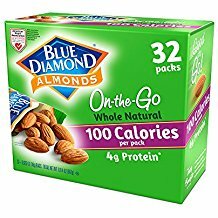 Almonds pretty definitely contain almonds, amirite? And I’m not talking about ye olde crappy Double Bubble, the pink menace of Halloween treat bags everywhere. 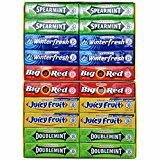 I mean halfway decent gum you’d actually chew. For my kids, any kind of gum is a special occasion. 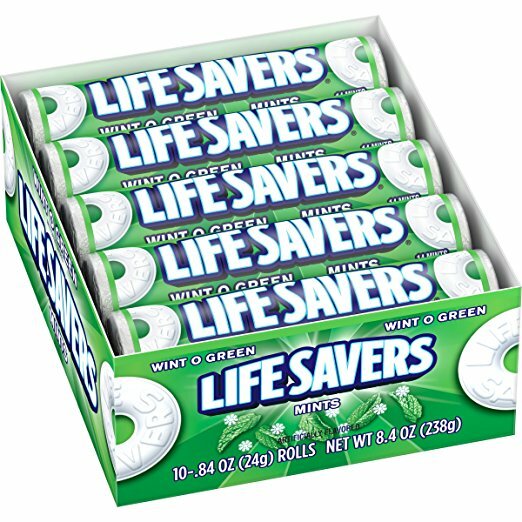 Similarly, my kids think mints are candy. Let’s keep it that way! Wishing you a happy, healthy Halloween!